Sagittal dysplasia is the most common skeletal malocclusion seen routinely in orthodontic patients. The evaluation of relationship of maxilla to mandible in sagittal plane is crucial before orthodontic diagnosis and treatment planning. Various criteria’s to evaluate the sagittal discrepancy; however, the angular and linear measurements that were given were affected by several factors that made it difficult to evaluate the anterior–posterior discrepancy using a single criteria. Historically, orthodontists have related both the maxilla and the mandible to reference points in the cranial base of the skull. The first step in evaluating anteroposterior apical base relationship cephalometrically was by Down’s description of points A and B. Reidel measured the SNA and SNB angle and used their difference or ANB angle as an expression of dental apical base relationship. Steiner proposed the appraisal of various parts of the skull separately, namely the skeletal, dental, and soft tissues. The ‘Wits’ appraisal, suggested by Jacobson, relates points A and B to the occlusal plane. Beta angle was introduced by Baik and Ververidou, as the angle between the last perpendicular line from point A to the C–B line, and the A–B line., This angle does not depend on any cranial landmarks or dental occlusion. 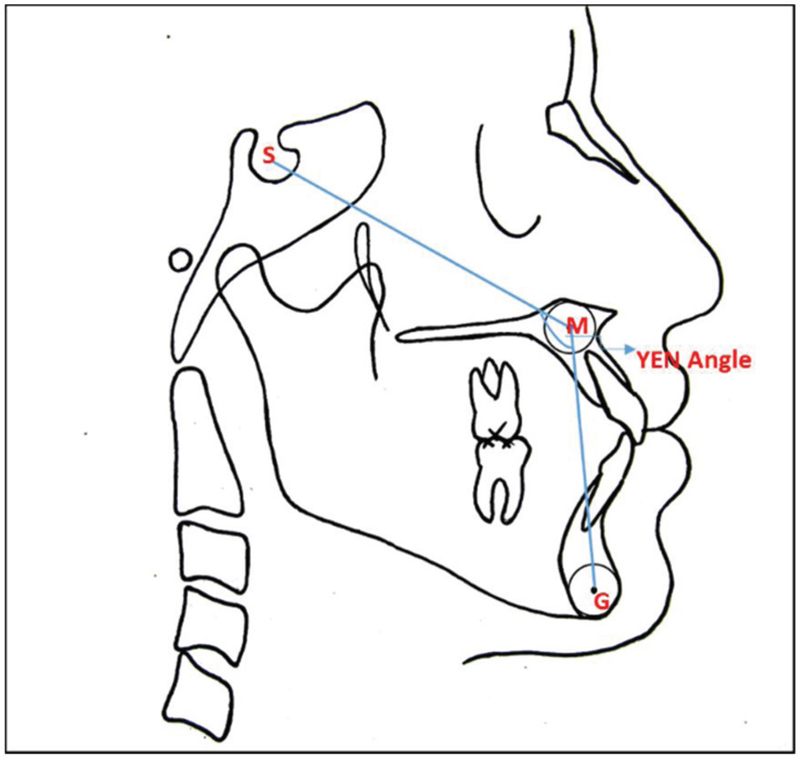 YEN angle was introduced by Neela et al., as angle between SM and MG line where M and G point are centroid of premaxilla and mandibular symphysis, respectively. Nagar et al. in 2014 proposed an extracranial reference line common to both denture bases, instead of the occlusal plane to assess anteroposterior jaw relationships. They found that the horizontal appraisal method proposed eliminates the demerits of the occlusal plane and has the merits of simplicity and accuracy in comparison to Wits appraisal. The present study is aimed to compare the credibility of five cephalometric measurements in assessing the antero-posterior jaw relationship and to assess the correlation between various measurements used for antero-posterior discrepancy, including ANB, Yen angle, Beta angle, Wits appraisal, and horizontal appraisal. The study was a prospective study and was approved by the institutional ethics committee with a ref no: 16118. The sample size for the study consisted of 99 patients aged 16 years and above, who had reported for orthodontic treatment. The patients were subdivided into skeletal Classes I, II, and III groups of 33, each based upon the ANB angle derived from the pretreatment cephalogram. Patients with age group above 16 years. All lateral cephalograms were taken on PLANMECA proline EC machine with exposure values set at 68 kVP and 12 mA with maximum exposure time of 0.5 s using high-speed polyester-based 18 × 24-cm Kodak X-Omat (Sigma -Aldrich, India) lateral head films with a wire mounted in front of the cassette to indicate true vertical on the film. The lateral head films were obtained with a plumb line oriented to the F–H plane, and these were then traced on acetate tracing sheet using variable X-ray illuminator. For study purpose, seven reference points were marked directly on each film with a soft sharp pencil. Then after tracing, using ANB angle, the sample was divided as skeletal Classes I, II, and III. The true vertical line (TVL) was traced on the film from the plumb line seen on the radiograph. And a true horizontal (HOR) line was drawn 90° to the true vertical plane. Next the sagittal relationship was measured and compared for each group by following the parameters given below. Sella (S): The midpoint of the hypophysial fossa. Nasion (N): The most anterior point of the frontonasal suture in median plane. Point A: The deepest midline point in the curved bony outline from the base to the alveolar process of the maxilla. Point B: The most posterior point in the outer contour of the mandibular alveolar process, in the median plane. Center of condyle (C): Found by tracing the head of the condyle and approximating the center. Point M: The center of the largest best fit circle tangent to anterior, superior, and palatal surface of premaxilla. Point G: It was determined by the center of the largest best fit circle tangent to the internal, anterior, inferior, and posterior surfaces of mandibular symphysis. TVL: Vertical line traced on the film derived from the vertical plumb line. HOR: Line drawn perpendicular to the true vertical plumb line traced on the radiograph. ANB: Angle between points A, N, and point B [Figure 1]. Wits: Distance between the perpendicular projection of A and B on the occlusal plane [Figure 2]. Beta angle: The angle between the last perpendicular line from point A to C–B line and the A–B line [Figure 3]. YEN Angle: Angle between the SM line and the M–G line [Figure 4]. AH/BH: Linear distance between the perpendicular projection of A and B on HOR plane [Figure 5]. The methodological error within the cephalometric analysis was determined by having 15 measurement values analyzed on randomly chosen cephalograms after 1-week interval by the same examiner. The error was determined by means of Dahlberg’s Formula (mean error ratio SE = d2/2n, where d = difference between the measurements at two different times; n = number of measurements). All statistical analyses were performed using SPSS Statistics Version 20.0 (SPSS Inc., Chicago, Illinois, USA). Descriptive data that included arithmetic means and standard deviations of all the five parameters were calculated. Receiver-operating characteristics curves were run to examine sensitivity and specificity of all the parameters. Correlation coefficients were obtained for each of parameters to compare their relationship with other parameters in Classes I, II, and III groups. The level of statistical significance was established at P < 0.05. The mean values for all the angles in the three skeletal groups are listed in [Table 1]. One-way ANOVA showed statistically significant differences between mean values of all the parameters among the three skeletal groups. The methodical error when evaluating angular measurements on the lateral cephalograms was below 0.5°. This value was acceptable according to Trpkova et al. 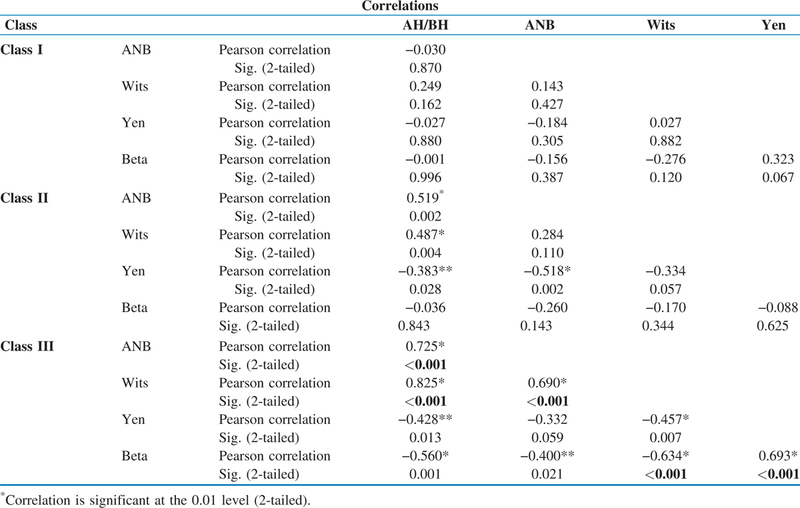 There was statistically significant correlation between AH/BH and ANB, AH/BH and Wits, AH/BH and YEN, ANB and YEN in Class II group, between AH/BH and other four parameters, ANB and Wits, ANB and Beta, Wits and YEN, Wits and Beta, Yen and Beta in Class III group [[Table 2]]. [Table 3] gives the cutoff values for all the five parameters to determine Class I, Class II, and Class III skeletal groups. The results showed that AH/BH and ANB had very high sensitivity and specificity to discriminate a Class II from Class I and Class III from Class I. Wits, YEN, and Beta showed lower specificity to differentiate Class II from Class I and Wits and Yen to differentiate Class III from Class I except Beta which had 100% sensitivity to differentiate Class III from Class I. In orthodontic diagnosis and treatment planning, evaluation of the antero-posterior jaw relationship is an indispensable step. Both angular and linear cephalometric variables have been proposed to analyze sagittal jaw relationship and jaw position. This study attempted to analyze different cephalometric parameters which were used to indicate the sagittal jaw relationship in Classes I, II, and III malocclusions and also to compare horizontal appraisal with those other parameters in assessment of sagittal jaw discrepancy. 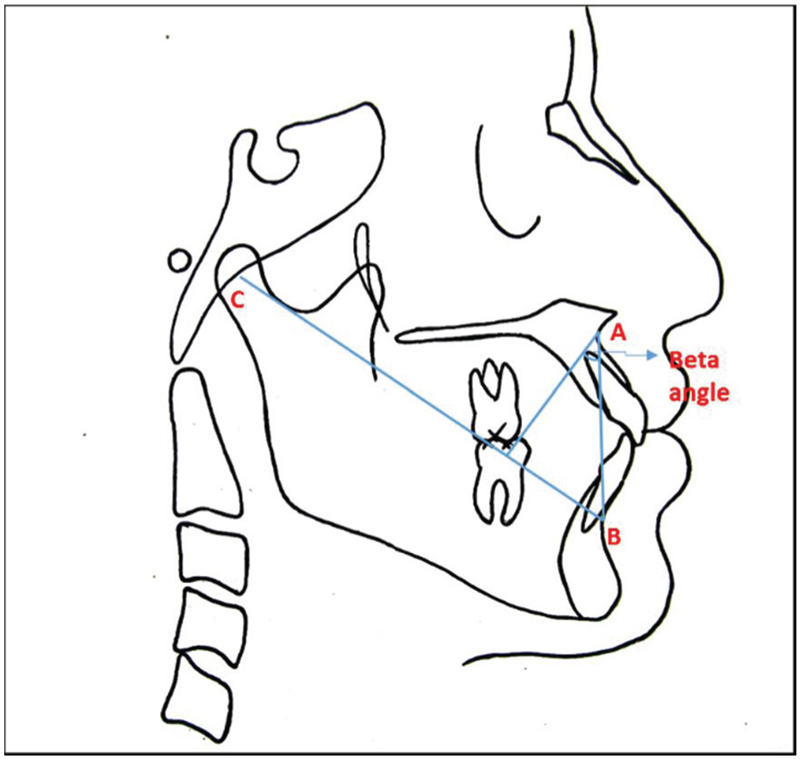 These variables can be erroneous as the angular variables can be affected by changes in facial height, jaw inclination, and total jaw prognathism, whereas linear variables can be affected by the inclination of the reference line. In the current study, three angular and two linear variables had been used to assess the antero-posterior jaw relationship. ANB, YEN angle, Beta angle were the three angular variables and Wits appraisal and horizontal appraisal were the two linear variables. All the parameters were found to be equally significant in assessing the antero-posterior discrepancy like previous studies,, [[Table 1]]. However, each of the parameters had their own demerits; hence, a new a parameter was compared in this study, that is, horizontal appraisal method. The most popular parameter for assessing the sagittal jaw relationship remains the ANB angle, but it is affected by various factors and can often be misleading. Nanda and Taylor, have shown that position of nasion is not fixed during growth, and any displacement of nasion directly affects ANB angle. Furthermore, rotation of the jaws by either growth or orthodontic treatment can also change the ANB. To overcome this, the Wits appraisal was introduced which avoids the use of nasion and reduces the rotational effects of jaw growth, but it uses the occlusal plane, which is a dental parameter to describe the skeletal discrepancies. Occlusal plane can be easily affected by tooth eruption and dental development as well as by orthodontic treatment. A popular recent alternative, Beta angle avoided use of functional plane and is not affected by jaw rotations. 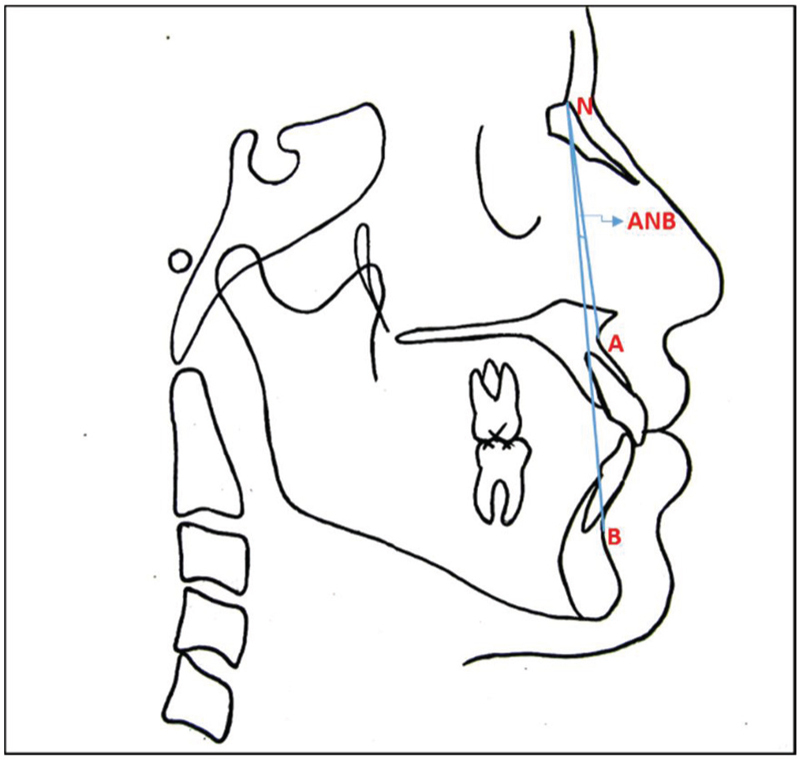 But it uses points A and B, which can be remodeled by orthodontic treatment and growth., Furthermore, as shown by various studies, the reproducibility of the location of condylion on closed-mouth lateral head films is limited., Instead of condylion, center of condyle could be used, but approximation of center of condyle is difficult. This could give a nonsignificant error of approximately 1°. Yen angle was introduced to overcome few of these deficits. This does not utilize A and B points as skeletal landmarks, which are affected by local remodeling due to orthodontic treatment or occlusal plane as in Wits. Instead it utilizes points M and G which are not affected by local remodeling, and they approximate to being centroid points similar to sella. As it is not influenced by growth changes, it can be used in mixed dentition as well. But rotation of jaws can mask true sagittal dysplasia here too. To overcome these existing problems, the horizontal appraisal method was developed. This method used extracranial reference line, that is, HOR plane through NHP. The other commonly used reference plane for assessing AP discrepancy are the SN plane, Frankfort horizontal plane, and occlusal plane, all of which have been shown to have limitations.,, Cooke and Wei reported variance of intracranial reference planes to the true vertical in NHP ranging between 25° and 36°. In contrast, the variance of extracranial reference plane in NHP was 4°. The variability of the HOR as a cephalometric reference plane in NHP therefore represents at least a six-fold improvement in reliability in relation to the variability of previously used intracranial reference planes, and therefore, AP analysis based on NHP and the HOR also should be more clinically relevant. The results in the present study revealed that all the five parameters considered in the study were accurate in determining the antero-posterior jaw discrepancy with horizontal appraisal (AH/BH) being highly sensitive and specific followed by ANB for discriminating a Class I from Class II and Class III malocclusion and also Class II from Class III malocclusion, and YEN angle for Class I from Class II and Beta angle for Class I from Class III as shown in [Table 3]. The receiver-operating characteristic curves showed that the cutoff point between Classes I and II groups could be considered a AH/BH of approximately +3.5 mm and between Classes I and III groups, approximately −0.5 mm. These two values coincide with the mean value from Class I; therefore, it can be predicted with a high degree of certainty that a patient with an AH/BH between +3.5 and −0.5 mm truly has a Class I skeletal pattern. This also indicates that a patient with an AH/BH less than −0.5 mm has a Class III skeletal pattern and one with an AH/BH greater than +3.5 mm is Class II. The second objective of this study was to assess the correlation between various parameters used to measure the antero-posterior discrepancy-including ANB angle, Beta angle, Yen angle, Wits appraisal, and horizontal appraisal. For this purpose, multiple correlation analysis was performed between the various parameters used in this study. There was statistically significant correlation between AH/BH and ANB, Wits and Yen angle; ANB and Yen angle in Class II patients. In Class III patients, there were highly significant correlation between AH/BH and ANB; AH/BH and Wits; ANB and Wits; Beta and Wits; and Yen and Beta angle. The above results indicated that the newer horizontal appraisal method AH/BH might be considered highly interchangeable in the assessment of antero-posterior jaw relationship along with ANB and Yen angle in Class II patients and ANB and Beta angle in Class III patients. Although this study proved that all the parameters were efficient in determining antero-posterior skeletal discrepancy, with AH/BH being one of the most credible parameter, it may not have given an accurate outcome in determining skeletal discrepancy due to the small sample size. Previously established parameters for assessing the anteroposterior jaw discrepancy have limitations associated with them. AH/BH can be used for assessing the true antero-posterior skeletal discrepancy in daily clinical practice. It can also be a valuable tool when planning orthognathic surgery for patients with antero-posterior and vertical skeletal deformities, because it can help to distinguish between true skeletal Classes I, II, and III patterns, regardless of factors that would tend to mask them. The horizontal appraisal method enriches the current cephalometric tools available for the clinician to assess the antero-posterior jaw relationship accurately and reproducibly. Qamaruddin I, Alam MK, Shahid F, Tanveer S, Umer M, Amin E. Comparison of popular sagittal cephalometric analyses for validity and reliability. Saudi Dent J 2018;30:43-6. Bohra S, Udeshi PS, Sinha SP, Saidath K, Shetty KP, Krishna Nayak US. Predictability of pi angle and comparison with ANB angle, W angle, Yen angle, and beta angle in South Indian population. J Indian Orthod Soc 2018;52:22-8. Neela PK, Mascarenhas R, Husain A. A new sagittal dysplasia indicator: The YEN angle. World J Orthod 2009;10:147-51. Nagar S, Nagar R, Raghav P. Why WITS? Why not a way beyond? Contemp Clin Dent 2014;5:518-23. Trpkova B, Major P, Prasad N, Nebbe B, Broadbent B, Baumrind S et al. Cephalometric landmarks identification and reproducibility: A meta analysis. Am J Orthod Dentofac Orthop 1997;112:165-70. Relwani P, Gowda NC, Ramegowda S. Comparative assessment of changes in sagittal relationship of maxilla to mandible in class II malocclusion—A cephalometric study. Indian J Orthodontics Dentofacial Res 2016;2:77-82. Aparna P, Dilip Kumar N, Prasad M, Shamnur N, Arun Kumar G, Sridhar KR et al. Comparative assessment of sagittal skeletal discrepancy: A cephalometric study. J Clin Diagnostic Res 2015;9:38-41. Hussels W, Nanda RS. Analysis of factors affecting angle ANB. Am J Orthod 1984;85:411-23. Taylor M. Changes in the relationship of nasion, point A, and point B and the effect upon ANB. Am J Orthod 1969;56:143-63. Bishara SE, Fahl JA. Longitudinal changes in the ANB angle and Wits appraisal clinical implications. Am J Orthod 1983;84:133-9. Riccarda R, Cohen AM. The relationship and reproducibility of angle ANB and the Wits appraisal. Br J Orthod 1991;18:225-31. Dhinahar S, Dilipkumar D, Suresh P, Tandon A, Pereira A. Accuracy of beta angle in assessment of sagittal skeletal discrepancy Chennai population—A cephalometric study. J Pierre Fauchard Acad (in diasection) 2017;31:43-6. Moore RN, DuBois LM, Boice PA, Igel KA. The accuracy of measuring condylion location. Am J Orthod Dentofacial Orthop 1989;95:344-7. Adenwalla ST, Kronman JH, Attarzadeh F. Porion and condyle as cephalometric landmarks—An error study. Am J Orthod Dentofacial Orthop 1988;94:411-5. Cooke MS, Wei SH. A summary five-factor cephalometric analysis based on natural head posture and the true horizontal. Am J Orthod Dentofacial Orthop 1988;93:213-23. Lundström A, Lundström F, Lebret LM, Moorrees CF. Natural head position and natural head orientation: Basic considerations in cephalometric analysis and research. Eur J Orthod 1995;17:111-20.